It’s a good movie. It’s very well done. It’s well acted. It’s entertaining and it’s educational. It is also very careful about what it shows and what it leaves out. This is not a documentary, so it’s unfair to expect a balanced viewpoint. 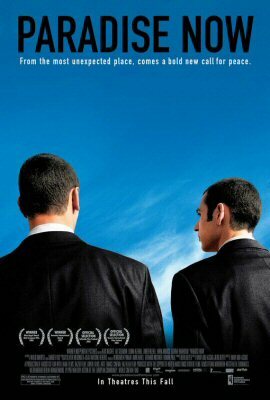 In reality, this movie is by design anything but balanced (and that’s completely valid): It shows the Israeli-Palestinian conflict as seen from the eyes of two young guys from Nablus that get recruited to carry out a suicide bombing in Tel-Aviv. As such, the movie depicts an important part of the whole picture. But only a part. What worries me (as seen through the ancient all encompasing prism) about this is that a lot of viewers don’t really know enough about the topic and will draw conclusions based on this incomplete picture. Even more worrisome is that many of the viewers that tend to watch this type of films, international artsy non-Hollywood foreign films, love to feel wise and knowledgeable even when they aren’t; so they are extra quick to form their own, strong, final, knowledgeable-sounding conclusions. And they’ll be happy to spread them, you know, in order to feel wise and knowledgeable. As a side note, the tagline used in the poster is “From the most unexpected place, comes a bold call for peace.“. It makes no sense to me how it relates to the movie. Can someone explain that?